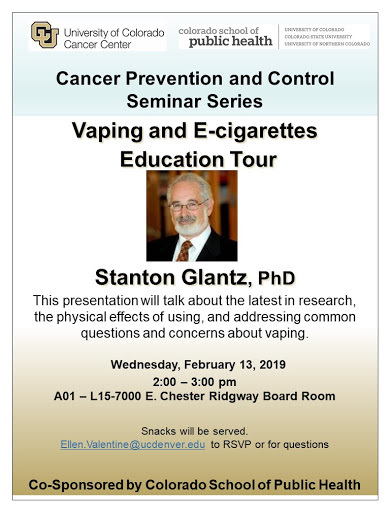 Dr. Stan Glantz is coming to Colorado to do a Vaping and E-Cigarettes Education Tour. Dr. Glantz is the Director of the UCSF Center for Tobacco Control Research and Education, Co-Leader of the Helen Diller Family Comprehensive Cancer Center Tobacco Program and a member of the Cardiovascular Research Institute and Philip R. Lee Institute for Health Policy Studies. He is author or coauthor of numerous publications related to secondhand smoke and tobacco control, as well as many papers on cardiovascular function. He is the author of 5 books and nearly 400 scientific papers. Among them are Tobacco: Biology and Politics for high school students and The Uninvited Guest, a story about secondhand smoke, for second graders. Rocky Mountain Hospital for Children – February 13 from 5:30pm to 7:00pm and February 15 from 11:30am to 1:00pm. To register for this these dates call (877) 752-2737, or register online at RockyMountainHospitalforChildren.com/calendar.